Shiva! C’mere! Hey! I mean it! Come. Here. Shiva has a good recall. She doesn’t have a great one, or even a solid one, but she has a good one. Item number 97 on my life list is to perfect my dog’s recall. We’re not anywhere near that level yet but I think we are getting there. Recalls weren’t always something I deemed very important. We worked on them in our early obedience classes, however, I didn’t think I’d be letting her free to roam any time soon. The first time Shiva got off-leash – she slipped her collar at the park – I panicked. After all, my only experiences with dog ownership usually resulted in watching my escape artist husky run over a hill and never come back. I assumed all dogs just naturally ran away once off-leash. Wouldn’t you? Apparently this is not always the case. Shiva has never run away on purpose. She just runs around. There is a very surprising difference. I don’t know if it has anything to do with her abandonment issues, which she has in spades, or if she just instinctively likes to keep us in her line of sight. Once I learned that Shiva wasn’t interested in taking off and never coming back, I stopped worrying so much about having a good recall. After all, my dog was a natural. Agility changed my mind-set completely. In many ways the sport has made me a better trainer. I am much more aware of my body language in regards to Shiva and am much more present during our activities together. I learned very quickly that if we ever hope to succeed, Shiva’s recall will have to be excellent. There are no leashes, no collars, and no treats on the course. Without a recall, we’ll never get there. Last summer, I signed up for Susan Garrett’s online recall course. I learned a ton of different games that would help increase Shiva’s focus and drive to work with me. We are much further now than we have ever been. Her recall is pretty much 100%. Add in dogs, people, cats, birds, shopping bags that blow in the wind… It’s a completely different thing. I can call her away from another dog easily enough – once she has reached him. I don’t even try to stop her once she has set off in a dead run. There is no point. She won’t remember I exist until she has reached her destination. Obviously, this is problematic. People don’t always appreciate a dog running up to them at top speed. Other dogs don’t always enjoy a Shiva onslaught either. I can’t say I blame them. This prevents me from taking her to some of the nearby off-leash sports fields during normal hours. Given our lack of a fenced yard, we don’t get a chance to work on off-leash behaviours unless we can go to these fields. I can go after dark – and have done so – but for a lot of reasons this is hardly ideal. The parks are not always well-lit for one. I’ve had problems with that before. So, what to do? I am curious how others have trained recalls. Any tips? Do you think it is something every dog should have or do you think it isn’t necessary for the average city pooch? I realise every dog is different and that some dogs are just never outside without a leash. I also know some people who almost always walk their dogs off-leash. Recalls can be a controversial training subject. Some think they are essential and reflect an owner’s relationship with her dog. Others see them has something nice to have but feel other things are more important. Where do you stand? I managed to get it together enough to participate in Life With Dogs’ Saturday Pet Blogger Hop! Click on the badge below to check out the many other participating blogs. Happy Hopping! Oreo’s recall is horrible. Not good for a dog who gets frightened easily. Working on recalls has moved to the top of my priority list just this week! I started researching ways to teach solid recalls. Boy, there is a lot of information out there. I have Patrica McConnell’s video, “Lassie Come!”, in my rental queue at BowwowFlix. I’m hoping that she has a good method I can implement. Thanks for the video suggestion! Patricia McConnell’s advice has done wonders for us in the past. I don’t know why I haven’t thought of checking out what she has to say about recalls. There is a TON of information. Everyone thinks their solution is the best one. It’s a lot to sort through for sure. I signed an adoption contract that says I will never take my Greyhounds outside without a leash. I actually don’t take our dogs out without a leash for a lot of reasons, but we still practice recalls. I think the biggest lesson is never to call them when you can’t be sure that they will return. Don’t call them if they’re really interested in a rabbit hole or something, go to them, because the recall is something that is never to be ignored. Understandably, greyhounds are probably not ideal off-leash dogs. Sighthounds in general are probably very very hard to call off once they’ve caught sight of something fun to chase. Just as a bloodhound or a beagle is almost impossible to call off of a scent. My grandparents actually lost their beagle that way. Sheena just never came back. It was pretty tragic. I agree as well. I never call Shiva if I don’t think there is a chance she is going to come. It’s teaching her to ignore the word, that it has no value or meaning. This is such a timely post and I could have written it myself. We’re facing the exact same thing with Honey. When we’re alone, I practice hiding and walking in new directions. I occasionally bring out toys or treats. It keeps her very focused on us. We’ve even had good experiences at the dog park. I wait until she’s not totally focused on another dog and I call her to me. She’s gotten amazed looks at her perfect recall. 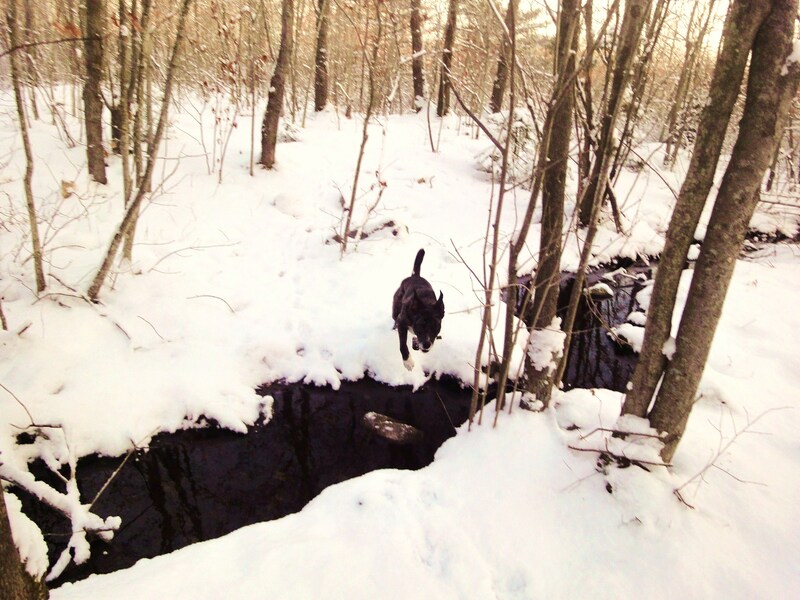 But twice lately, we’ve been walking with her off leash in rural areas. When she saw another dog, she took off running toward him (males both times) and didn’t even notice us calling her. We were lucky. One dog adored her. The other one didn’t but he tolerated her attention until we got to her. I’ve done everything I’ve ever read to encourage a perfect recall. The only thing I think I can do is get more chances to practice around other dogs–her biggest temptation. I’m looking for an advanced, group training class now so we have a chance to work on this. And thanks, Sara, for mentioning Bowwow Flix (I’ve never heard of this) and Patricia McConnell’s video. I’ll check it out. That’s pretty much where we are as well. Once Shiva has gotten to sniff the dog or person, she will come back to me as soon as I call. But to stop her from reaching them is almost impossible. She has to be really tired first. It’s good to know I’m not the only one struggling with this. We’ve come a long way over the last year but I’d really like for it to be perfect. Maybe a group class is something I should look into as well. Or just more time at the dog park with chicken in my pocket. Both Sheba and Senta had perfect recall – Teddy Bear about 90 percent recall – Nicki – 50 percent on a good day with a t bone in one hand and a cookie in another. We were out in the bush one day when Senta spotted some black bear cubs – she of course thought she had new playmates – I called her name once and called come once and she was back – it was then I appreciated what we had trained her to do. That’s awesome you were able to call Senta away. What a huge relief! I am thinking now I need to work on proofing my freak outs. Shiva will usually only come if I ask her in a happy, excited voice. But in a situation like that, with a bear so close, I don’t think I’d be able to keep my voice so calm. So it’s probably a good idea to start pretending to be freaked out and asking her to come to me. If I start small, just in the house at first, I am sure it will make a difference. I have no real tips for training it as I’m still working on Georgia’s! It’s much better than it used to be but far from perfect. These days, I particularly like doing it while there are other dogs and food around. If it works under these circumstances, the chances are good that she’ll respond in an emergency situation. In the early days of training it, I found it better to recall when she was close enough and not distracted – just to get her used to the idea of responding quickly. BTW, I don’t think recall reflects an owner’s relationship with her dog. Although it can be embarrassing when your dog doesn’t come when called :p I DO however think it’s essential. Yikes, that’s so awful. It is definitely a concern for me as well as Shiva has run beyond fences towards the street. She has never run onto the road but I know it could happen. This is why I think I do need to work on my “freaked out” voice as I mentioned above. It sounds like you are being very smart with Georgia and I know you both will get there as well. Recalls are vital, I think, and on some level, they do say something about the connection one has with her dog. I don’t know if a recall should be used as a way to judge something like that, but I know the people I have seen who can call their dogs off of a rabbit without hesitation, communicate with their dogs in a way I envy. Since you and Georgia do have an enviable relationship, I know you will get to that point as well. It just takes time. Happy Valentine’s Day Ms T! i think recall is a very important skill to train so that you are prepared for unexpected situations, like a dog slipping out of a collar or giving chase. this is not to say that my dogs have wonderful recalls. booker and asa are about 60/40…i’m sure we’ll be working on it for quite some time. ha. like others have mentioned, when practicing, definitely don’t call your dog when they are most likely too distracted to respond. Thanks for your comments. The more prepared we are to protect our dogs from danger, the better. I agree. I think it’s also probably one of the harder things to train because there are so many more valuable things in the environment that are more interesting than us silly humans. It’s probably something that needs to be practiced and reinforced for the entirety of the dog’s life. I wasn’t sure how I felt about having two recall words. When I say “come”, I mean come, regardless of the situation. But then I thought about it and discussed it with my husband and I think I see your point now. As I mentioned above, I too tend to freak out if I think Shiva is in immediate danger. Perhaps proofing a freaked-out voice is a smart idea. I don’t know if changing the word is necessary, but changing my tone definitely is. Thanks for the link and for weighing in. You have done awesome things with your dogs and have a relationship with them I aspire to. For the most part my dogs are solid, we took a class called “Really reliable recalls” in Alaska in which the instructor brought in distractions (even moose poop, she was dedicated). Moose poop! I love it. I suppose in Alaska you never know what you will come across. It sounds like it was a great class. We are still working on Eva’s recall as her recall is really unpredictable. I don’t dare to let her go off leash in the public or at the parks. In fact, we don’t have many dog friendly parks to go because most parks have the doomed sigh which says ‘no dogs allowed’. If you know where I live, you know the reasons at the back of it. So the parks that we go are usually full of dogs, I never feel safe if I let her go off-leash when there are too many other dogs. First of all, she is ultra friendly and very submissive, I don’t even think she knows what fighting is so she might be ended up being bitten or bullied by others. Secondly, I don’t know where she will run to if she is free from me. Sometimes, I feel like testing her to see whether she has improved her recalls but I still dare not do it in the public. If we do it at home, it depends on whether she WANTS to come to me even though I’ve treats with me. However, we didn’t do any recall training with Mika at all but his recall is fantastic!!! It made me wonder it’s my problems. It is because Eva knows she is loved and spoilt so she bullies me!!! It’s too bad there are so many spaces where dogs can’t go. I am assuming it is one of those situations where the few ruin it for everyone else. Recalls are hard and take a lot of work. We have been practicing for over a year now and we’re still not there. Some dogs take longer than others. It just takes practice and time. Eva is a very smart dog, she is a Sheltie after all, and I am sure she will pick up on it fast. But I totally understand your hesitation. My childhood dog routinely ran away once the leash was off. It made me pretty gun-shy with Shiva for a long time. Are there recall classes in your area? That may be a great place to start. I was told when I adopted Song to only let her off if she was in an enclosed run. Luckily my dad’s garden is large and fully enclosed, so Song races round that when we are over there. When I call her in from the garden, she often just stands and looks at me and I have to go and get her, which often results in her having another lap or two of the garden, before she finally comes over to me. It’s great you have such a safe space for Song to enjoy! I am jealous. Hopefully one day we’ll have a great big fenced yard of our own and this won’t be such a huge concern anymore. I think that people should have two recalls. One for everyday, and one emergency recall. The emergency recall should be heavily rewarded EVERY time it is used. The emergency recall should be 100%. It should mean stop WHATEVER you are doing right now and come to me as quickly as possible. In an ideal world =-). Charlie’s pretty much got it. Emma will do that if she knows it means we’re going home, though she’s pretty good otherwise. Which is not great. I tell my clients that they shouldn’t even consider taking their dogs off leash (we live in NYC, and have offleash hours at parks) until they can get their dogs to come to them on a 50ft lead with several distractions with zero pulling on the lead or luring with treats. It’s just too dangerous, since the dogs can run into traffic (if the park isn’t fenced), beeline for dangerous dogs, people, or just plain run away. There are some breeds I would not recommend ever taking off leash, they would include sighthounds and Northern breeds. Keep working on it with Shiva. We believe in you! Regardless of the situation, I heavily reward Shiva whenever she comes after I call her. Given her history of zoomies and blowing me off, I don’t want to have any relapses. It’s a very good idea to work with a long lead at first, I agree. Very smart. We probably started letting Shiva off-leash long before she was ready and this could be what has caused some of our struggles now. But I have hope we will get there. I second the thought on Northern breeds. As I mentioned, my childhood dog was a Siberian Husky who pretty much always ran off and away. We routinely had to call the shelters to get her back. 😛 When you don’t know, you don’t know. If I was to have a husky in the future, I would be a heck of a lot more cautious that’s for sure. Thanks for the vote of confidence and for weighing in with your thoughts. You are such a smart trainer and have done awesome things with Charlie and Emma. I hope one day to have half as much knowledge. Oly’s recall is, OK. AMAZING if I have treats. I’m talking spot on. But if I don’t have treats she knows it, and that dead sprint is not going to stop till she reaches those kids, that dog, that fence, no matter how I call. Great post! I personally feel that Recall is ESSENTIAL – maybe because I have a very large, powerful dog that many people tend to be scared of and I am keen for her to be a good ambassador (as well as having the peace of mind of knowing she is always under control – especially as you may have read in our recent ‘Ask Honey’ post that she is a very rough player and intimidates many dogs – I need to be able to call her out of any situation immediately and reliably). To this end, we have worked very hard on Honey’s recall and I can actually say that it is almost 100% bomb proof, under any distraction. The trainer we worked with back in Auckland used a combination of reward-based techniques and aversion techniques – I know, aversion & correction is very controversial and I’m likely to have people jump down my throat for even admitting that we use it but in our case, it works very well for Honey – anyone can see that it has not “broken her spirit” or damaged her bond with us or made her fear us or afraid to learn or any of those things and most importantly, if done responsibly and “correctly”, it is very effective – meaning it only had to be used one or two times and the change in behaviour is complete and long-lasting. Honey has better Recall than most dogs (even some Obedience champions are great in the ring but useless in the ‘real life’ situation of a park) and it means she can have more freedom, go more places, do more things – have a better quality of life overall, I feel. I am able to enjoy my time with her doing other stuff & teaching other things, rather than spend ages slowly & painstakingly training her using only positive reinforcement – which, when you have a breed that is very short-lived, is a big bonus. So in my book, that was worth it – short pain for long term gain. In general, I try to use only positive reinforcement but for certain things, I think responsible use of aversion/correction can be very effective. But it takes great skill & timing which most people find difficult to master and easy to abuse, so I can see why so many people are against it. Anyway, as you say, all dogs are different – it works for us with Honey but I know with certain dogs, using aversion techniques could be a disaster. For those keen on keeping things 100% positive, our trainer recomended the use of long lines which are very effective in making sure the dog always had to come when called – can’t get away with igoring you – but again, they require quite a lot of skill to use and aren’t suitable for all terrains/environments. I know this is going to sound like I am some kind of goody two-shoes or something, but other than my Aspen, I have never had an issue with recall – except for my Sheltie Jasper. When I first got him (as a foster) he would come to the dog park with me (and his sister). He would constantly wander off with whichever dog or dogs were most fun and interesting. Then, when it came time to leave, he would take off running. I usually had to ask people to help catch him. It was so frustrating. The reason he hated leaving was partly because he was having so much fun and partly because he hated the car because he always got sick in it. he has since gotten over his car sickness, but occasionally will not come right away because he hates to leave the park. So, I’ve turned it into a lovefest. He gets tons of praise when he comes to me and for recalls in general. Since he is an attention hog, this has worked well. I have used treats in the past, but I don’t know what I would do if I had a dog that didn’t respond to either of those!